If you're looking to start a dumbbell routine as part of your exercise program, you're taking a step in the right direction. Strength training will help you build muscle, but it's also beneficial for warding off chronic diseases, building bone mass and helping you maintain your weight, according to the Centers for Disease Control and Prevention. Don't make the mistake of lifting too little or too much weight, however. Too much and you'll set yourself up for injury, too little and you won't be getting much benefit from your efforts. First, it's important to understand what is going to help you make the most progress in your quest to get stronger or build muscle tone. 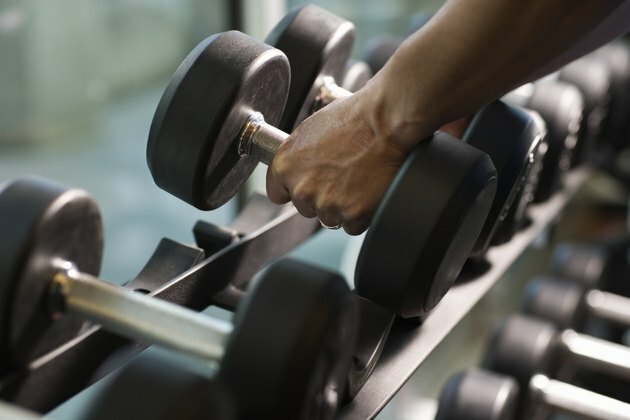 When you lift any kind of weight, the important thing is to achieve muscle fatigue -- meaning toward the end of the 12- to 15-repetition set, your muscles will feel exhausted and you won't be able to do any more. For some people that might mean lifting a 10-lb. dumbbell; for others, it could be a lot less or a lot more. Since the goal is to lift to fatigue, the exercise you're doing is also going to come into play. With the bench press, for example, you're using your chest, shoulders and arms to press the dumbbells upward. Using all of those muscles at once, called a compound exercise, means you'll have more power behind the move, and you'll be able to lift more weight. For the triceps extension, meanwhile, you're really only using the triceps muscles of the arms, so you may not be able to lift quite as much weight. When you're starting out with a dumbbell routine, you're going to have to play around with different weights in order to find the ones that fatigue your muscles. Dumbbells range in weight from 1/2-lb. up to about 50 lbs. If you want to purchase a set for your home, consider an adjustable set or a set with multiple weights so you'll have some variety for different exercises. If you're a total beginner, go to a gym, pick a weight off the rack and see how it feels in your hand. If it feels heavy when you pick it up, it's probably going to be too heavy to do a full set. As a general rule, err on the light side. For example, you might choose a 2- or 5-lb. dumbbell for bicep and triceps curls, and a set of 10-lb. weights for bench presses. If that feels really light as you're getting through the set, you'll know to move up in weight for the next round. One set of each exercise is adequate to help you build muscle -- though you can do two or even three sets if you're training with a specific goal in mind. Once you find that "sweet spot" of dumbbell weights that are not too light but not so heavy that you can't complete a full set of 12 to 15 repetitions, write down the amount you're lifting in a workout journal. That way, you'll know what size weights to use the next time. After about four to six weeks of lifting two to three times a week, you'll probably find that you need to move up in weight to continue feeling that fatigue toward the end of the set -- that's you getting stronger. Also, be sure to mix up your routine so you're not doing the same exercises during each workout. Doing the same routine time after time can lead to muscle adaptation that will mean you'll stop building as much muscle or making such great strides in strength. What Size Dumbbells Should I Use?